Running Linux on the IBM eServer iSeries server combines the strengths of Linux and OS/400 for an integrated solution. Linux delivers excellent open source solutions, while OS/400 is a premier integrated platform for business solutions. Linux enables a new stream of e-business applications for the iSeries platform that complements its strength as an integrated core business solution. Linux applications benefit from the iSeries platform’s ability to provide resource flexibility, security, reliability, and connectivity to other applications on a single server. 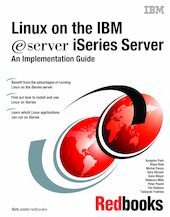 This IBM Redbooks publication begins with an overview of Linux, defines what open source means, and explains why using Linux on iSeries is beneficial. Then, it highlights how to install and use Linux on the iSeries server. It discusses the basic system administration tasks and Linux application development to help you manage your system and develop Linux applications on the iSeries server. It also introduces a wide range of services, such as Firewall, Apache, Samba, and e-mail, and explains the capabilities of each. This book is intended to help beginner and intermediate Linux users, with an OS/400 background, to implement Linux on the iSeries server.